The village of Reddelich is located 4 km from the town Bad Doberan and 6 km from the Baltic Sea in a beautiful moraine landscape in the landscape conservation area „Kühlung“. In Reddelich you can get to know 369 historic tree varieties on fruit meadows and rows of fruit trees while hiking on the meadows along the rows of fruit trees. But the trees are still young. They were planted in the autumns of 2014 through 2017. They still need some time and care until they bear the first fruits. Reddelich is on the way to develop a fruit paradise at the Baltic coast. 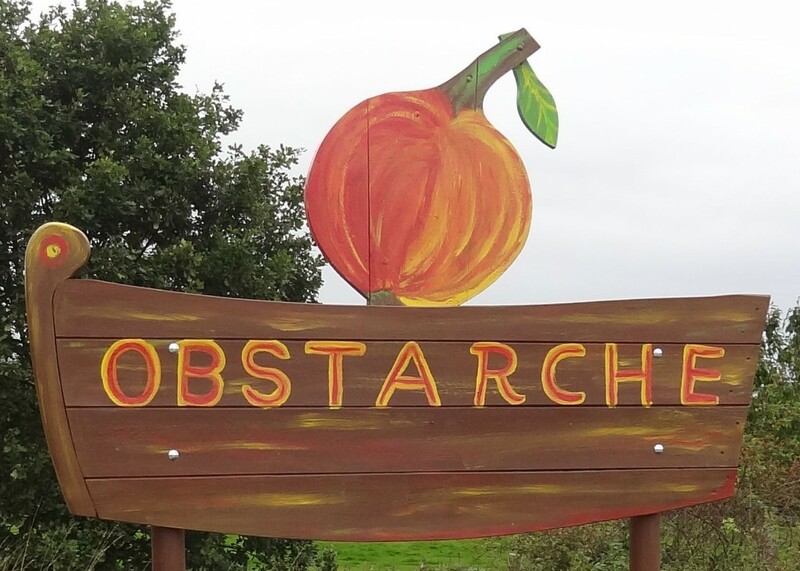 The Obstarche is a non-profit project of the cultural association in Reddelich and Brodhagen e. V. The Obstarche was launched in autumn 2014. We see ourselves as an intergenerational project. After all, the fruit meadows and rows of fruit trees that have been created will outlast and be maintained, used and continuously renewed for the next generations to come. 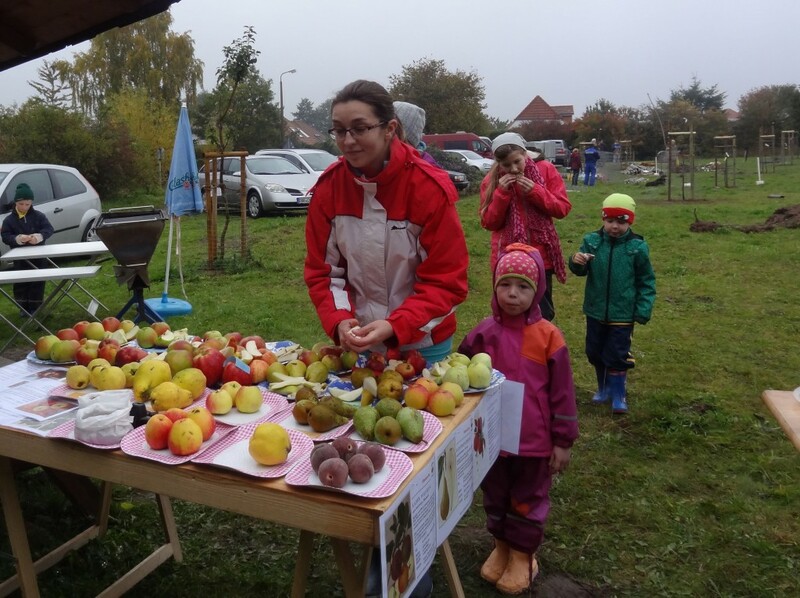 Our project is supported by the “Streuobstgenussschein” Mecklenburg-Vorpommern. The “Heidehof Foundation” supported our project from 2015 to 2017. 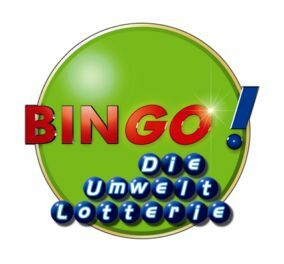 The Fielmann AG and the BINGO! supported our Project 2016. Biodiversity is perhaps the most important asset that needs to be protected. This includes the genetic diversity within the different species. Biodiversity is existential, it is our livelihood. Natural diversity is due to health, food, raw materials, safety and vital ecosystem services. With the establishment of meadows and trees, we create a secure location for rare and endangered varieties of fruit. With this we want to counteract the dwindling variety spectrum. Typical regional varieties are also planted. Here is also an old breeding of the Cistercian monks to mention: It is the apple variety „Doberaner Borsdorfer Renette“ with the cadaster No. 139. We also give you “Edelreiser” (saplings) from our precious mother garden to you, so that the old varieties are distributed and preserved. Terms of delivery for Edelreiser see here. 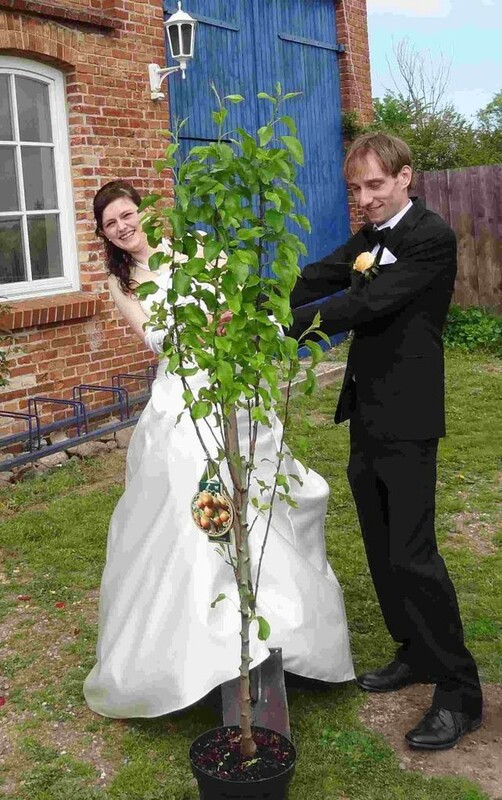 Each fruit tree is well documented in our cadastre. All 421 fruit trees that we have planted so far have been measured by GPS and transferred to our tree cadastre. Even old fruit trees on public ground were added to the community territory later. Thus, the fruit varieties will clearly identifiable in the future. 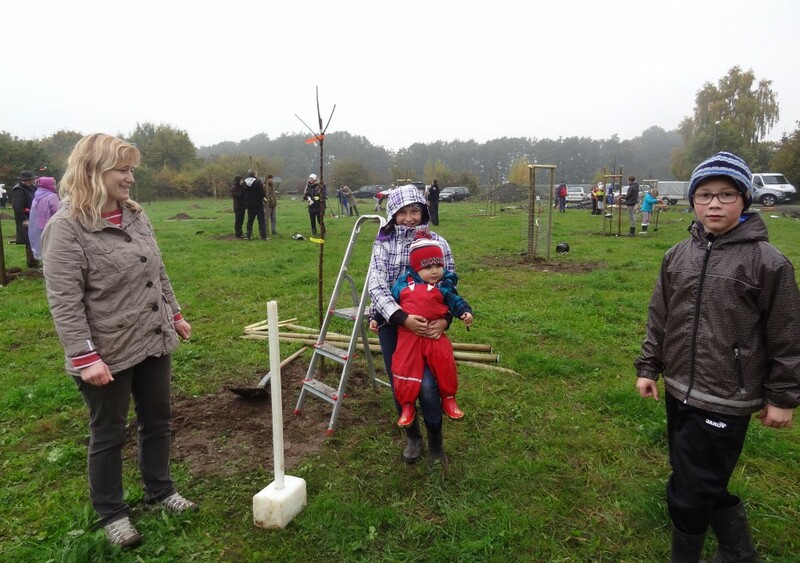 Plant festival on 19.11.2015 to plant the fruit meadow „Garden Eden“ with 134 high-stemmed trees. With the creation of new meadows we create valuable biotopes with a great biodiversity – a fruit paradise created by human hands. 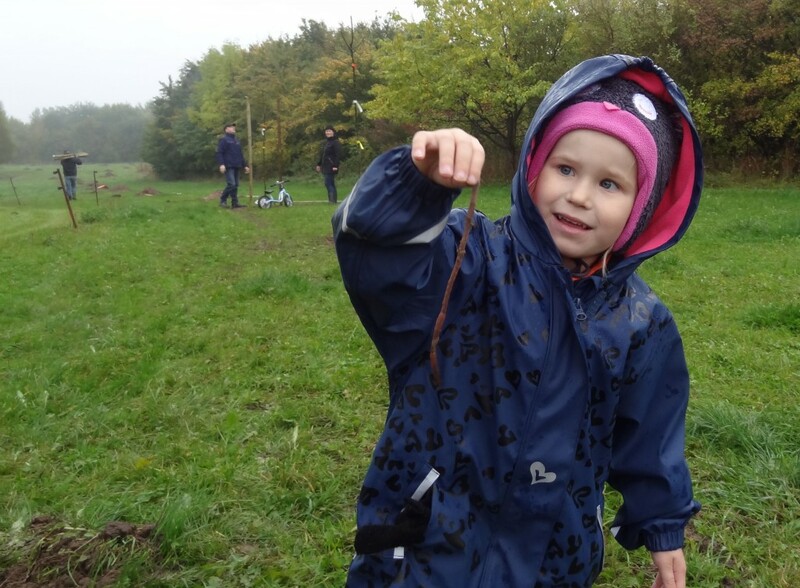 Our meadows belong to the most species-rich communities of Central Europe. Fruit meadows have positive effects on all natural resources: climate and air, soil, water, species and biotopes as well as the landscape and of course to humans. Since our meadows are in the drinking water protection area (drinking water protection zones II and III for surface water), the extensive use is very good for the preservation of drinking water quality. Of course, maintaining the biotopes is one of our goals in order to manage them sustainably. Our orchards and rows of trees should be accessible through a fruit trail as a hiking trail through nature. In this way we contribute to environmental education and increase the value of the landscape for our citizens and guests. 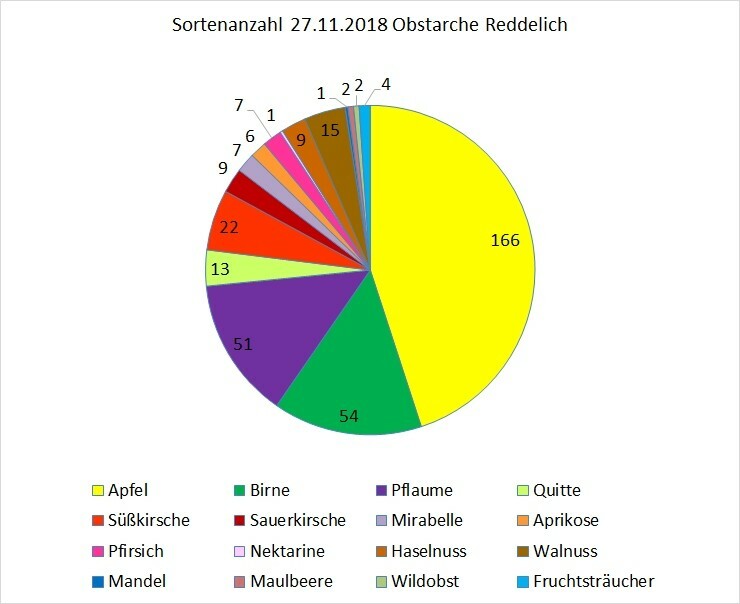 Our fruit trail should also lead along the „HANSEATENWEG“ through Reddelich. The „Hanseatenweg“ is a historic trail. It runs trought the area ​​along old trade routes between the hanseatic cities of Hamburg and Szczecin. We are located within the landscape conservation area „Kühlung“ with the fruit meadow areas. Wild orchards are part of our cultural landscape. They shape and structure our landscape. The creation of wild orchards and rows of fruit trees is a landscaping measure that is in harmony with the protection and conservation objectives of the landscape protection area and enhances the attractiveness of the landscape. With the fruit trail we support the tourism even in the off season. Hiking is healthy. We want to harvest the fruits with open campaigns and celebrate harvest festivals together with our citizens and guests. We would like to sell the healthy products (juices, jams, fruit brandies) of the fruit meadows and contribute to the care and preservation of these. This will also make an important contribution to support regional value chains. We would like to offer the public opportunity to symbolically plant trees to celebrate birth, weddings, families or memorials. This is an ancient tradition of planting a tree in Reddelich on the occasion of a memorable event or in memory of a loved one. We have already begun the design of a „Green Classroom“ along the newly planted orchards and fruit tree rows. Firstly theme boards were set up. In this way, we make a contribution to the environmental education of kindergartners and pupils. Here you can practically observe and explore nature. How valuable are historical fruit tree varieties? Old fruit tree varieties represent a valuable cultural asset that is already lost or can be lost without appropriate efforts. Thus, many beneficial varietal properties are lost, which may be needed in the future for humans or could be of great use. We want to treasure the old varieties like a precious treasure. Historic types of fruit trees are usually older than 50 years; the oldest varieties have been around for almost 1000 years. They are witness of long laborious breedings and historically significance. 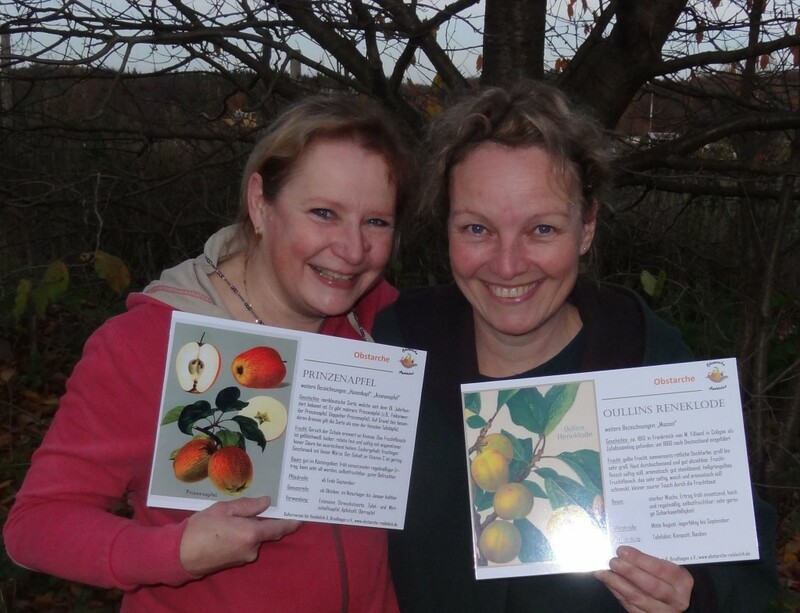 Which fruit trees have we planted? 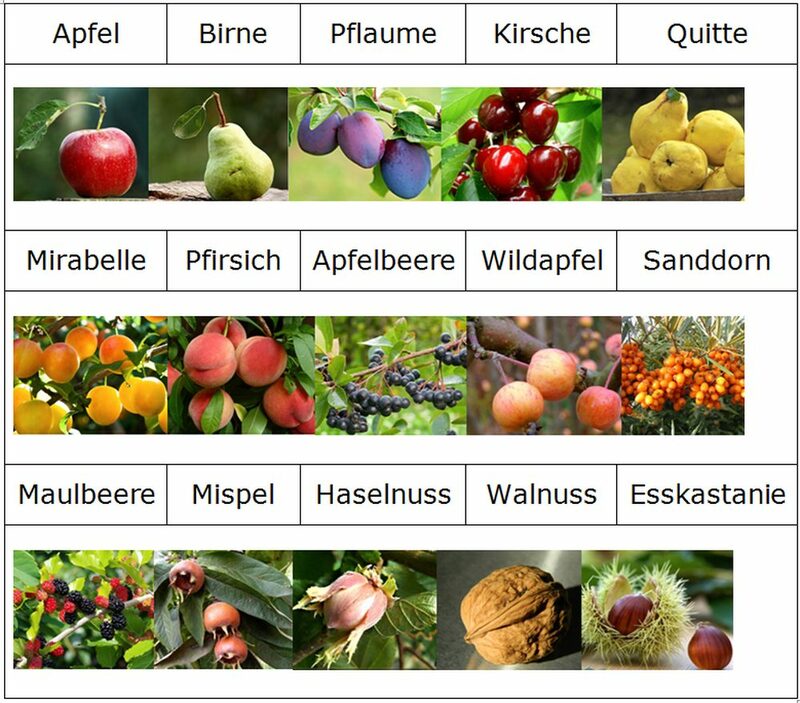 We planted historic fruit tree varieties that are related to Mecklenburg-Western Pomerania, adapted to our maritime-influenced climate and have proven themselves well in the past. Also varieties that stand out due to special properties, such as in taste, smell, suitability for specific uses and in appearance, come into consideration. Our previously planted varieties are listed on our page „Variety overview“. Where did we plant the fruit trees? The trees were planted primarily on communal property in the form of publicly propagated meadows and rows of trees along public roads. For the fruit tree plantations a concept confirmed by our local community exists. The fruit trees should be experienced through the fruit trail. 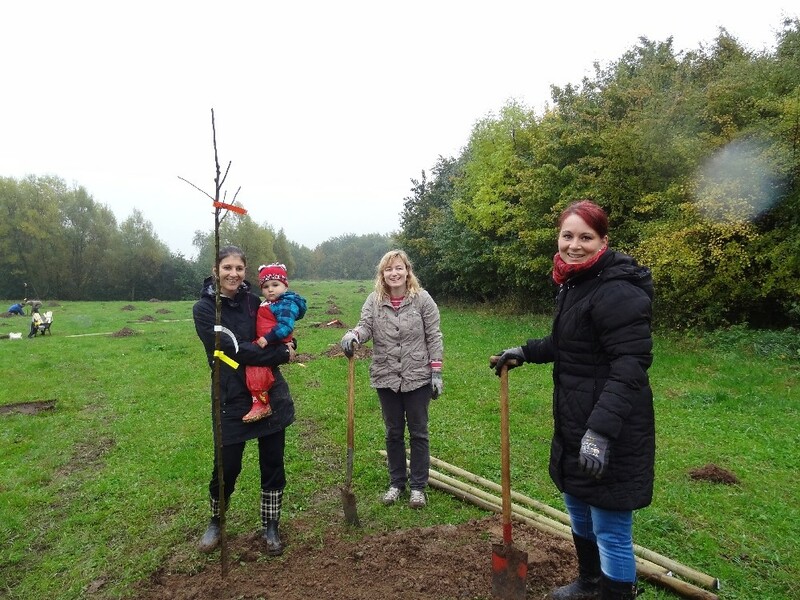 Three mothers plant “godfather trees” at the planting festival on 19.11.2015. Our patron since 2017 is the Minister of Social Affairs, Integration and Gender Equality in Mecklenburg-Vorpommern, Stefanie Drese. You can participate as a citizen in our project for the common good. We are very happy about your ideas and selfless participation.